Analyze a selected book to gain deep understanding of its content and connections to self, other books, and world knowledge. Develop a display that captures critical aspects of the selected book. Present the display in a fair-like atmosphere to family and community members. Identify an individual to serve as the school liaison. The liaison will be responsible for distributing and collecting permission slips and submitting a spreadsheet (attached to email) of students who intend to participate to the steering committee by September 17, 2018. The school liaison will also make sure that all potential participants understand expectations and have information about the event at Shepherd. Forward the name and contact information of your school liaison to Jennifer Szemborski jszemborski@k12.wv.us as soon as possible. Do we need to host a school level literature fair first? Schools are free to host a school level literature fair but are not required to do so. 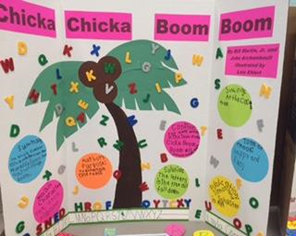 If you choose to host a literature fair at your school, you may organize and conduct it according to the needs of your students at either the classroom or school level. With or without a literature fair at your school, we do ask you to review each project prior to the regional event to ensure quality work. What should our students expect at the regional fair? Students should arrive at the Shepherd University ballroom (top floor of the student center) by 9 a.m. where they will be directed to table space reserved for their project. Students will present their projects to interested individuals from 9:30 to 11:30 in a ‘fair’ type atmosphere. Projects will not be formally judged, however, students will receive a certificate of participation. Participating students should not be dropped off; a parent or guardian on-site is required for liability reasons. Parking is available in the lot behind the Scarborough Library (see map). Student’s name, grade level, and category on the back. Attracts others and makes them interested in the work. Consider use of color. Any models, shadowboxes or other objects must fit in the middle of the display. Nothing alive, dangerous or valuable should be part of the display. No food! Students may hold or wear items that coordinate with the project. 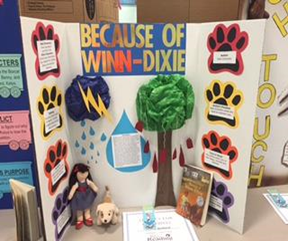 ​NO, students also have the opportunity to present their projects at the state level during the West Virginia Annual Literacy Conference, November 15-16 at the Greenbrier Resort in White Sulphur Springs. Interested students should contact, Mrs. Jennifer Szemborski for more details.